The obvious route for everyone will be by the M5, then the M6, leaving at junction 36. My driving time, apart from my coffee break, was 3¾ hours. If you want a coffee break, there are several services on the M6. Knutsford is a little over half-way. We will park at Brockhole, the Lake District Visitor Centre from which the walk starts. Be ready to start walking by 1330. You should make your own arrangements for lunch. There are plenty of places at Brockhole to eat a picnic lunch, or you could use the café. We could see no signs for the café in the car park. Climb the steps to Treetop Trek, then pass to the left of the building and go up the hill. The café is uninspiring, but if the weather is good you can eat outside and enjoy spectacular views. Another option is to use one of several pubs which you pass on the way. We start this walk from the Brockhole car park and cross the main road. The walk starts with a rather stiff ascent which is rough underfoot and which I will take at a leisurely pace. Once we have reached the top, there is a choice of routes, of which the longest has the best views. The distance is about 4.7 miles. Click for a map of the walk. 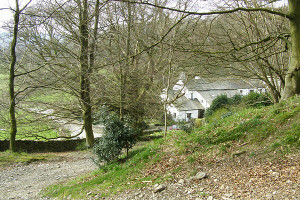 Dinner will be at 1845, followed by an illustrated talk on the Lake District by a member of Ambleside U3A. © Copyright mauldy and licensed for reuse under this Creative Commons Licence.